Contreras’s husband, Jorge Flores, used to have a small stand at a local market selling things like bananas and yucca, eggs and lunchmeat — trying to scrape out a profit in a place where hyperinflation often made his wholesale costs double from day to day. Then he was robbed at gunpoint by a local gang. And his brother crashed the motorcycle he used to supply his stand. So Flores abandoned the market stall and looked for other work. He does some plumbing jobs and the family has turned its living room into a barbershop, sheltered beneath a corrugated metal roof held down by loose bricks and planks. It’s decorated with origami-like stars that the family has made out Venezuela’s colorful but rapidly depreciating bolivar bills. 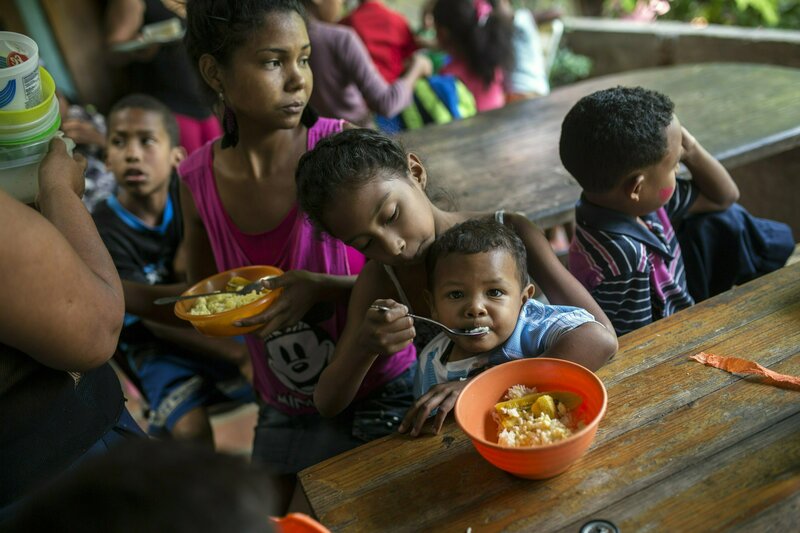 The scarcity of milk, medicine and other basics — along with routine violence — has eroded support for socialist President Nicolas Maduro even in poor neighborhoods like Petare that once were his strongholds. Maduro says there’s an opposition-led plot to oust him from power and says U.S. economic sanctions and local opposition sabotage are responsible for the meltdown. Contreras’ family of four gets those boxes, but it’s not enough to get by on for long. For months, they’ve been relying on the soup kitchen launched by opposition politicians as the main source of protein for their children. On a recent day, her 7-year-old son Jorbeicker played a pickup soccer game in the hilly, dusty streets in front of her home, while her husband practiced styling his mother’s hair. “I’m barely getting by,” Flores said, scissors in hand. The four-day power outage that brought most of Venezuela to a halt this month added to Flores’ misery. He wasn’t able to use the electric clippers needed to give customers the sort of trims they demand. Salcedo used to sell baked goods and juices to neighbors from the window of her kitchen. Then, her fridge broke down and she couldn’t find the money to fix it.